When you found out you were pregnant, you were overjoyed and a little anxious about expanding your family. And just like every new mom, you began to research and make plans for your baby. You obsessed about the safest car seats, the softest swaddling blankets, and the best sleeping arrangements. One thing you overlooked during all of your studying was the idea of postpartum depression. You believed that all of your investigation would prepare you not only physically, but mentally and emotionally for when baby arrived. However, there are so many new changes that occur within your family dynamic as well as within your body that the postpartum time period is turbulent at best. That doesn’t mean you won’t have a great experience, but it means that giving intentional thought to your life postpartum is a great way to start addressing the chances of developing postpartum depression early on. By creating a plan, you will feel better equipped to handle these changes when they occur. First time expecting parents, often have no idea how much of an impact having a baby will have on their lives. New mothers often feel isolated from friends, families, and surprisingly, even from their spouse. This is a normal response to all the changes that happen when the new baby arrives, but it can greatly impact the likelihood of suffering from PPD post-baby. As an expecting mother, you likely feel excited and are able to envision all the beautiful things that come along with bringing home baby. But, it’s doubtful you spend a lot of time thinking about the challenges you may feel emotionally when the baby arrives. Unfortunately, by not considering how hormones and lack of sleep contribute to feelings of anxiety and isolation, you’ll likely become surprised when you don’t feel like motherhood matches your expectations. The downside to not being prepared for these changes is that when it hits, you may feel like something is wrong with you. Not only do you feel guilty for questioning your decision to have a baby, you begin to distance yourself from others, and this disconnection only increases your feelings of anxiety. Eventually, you wind up avoiding making any decisions because the information is overwhelming. It’s as if checking out helps reduce your anxious feelings. But the truth is, many new moms struggle with worry about their first pregnancy. It’s ok to feel overwhelmed by the idea that any decision you make is going to impact the rest of your baby’s life. It is true that you are feeling a mixture of excitement and anxiety, but sometimes your anxiety overrides your excitement and keeps you from enjoying your pregnancy. There are several things that can help you feel more confident, prepared, and less anxious, especially creating an intentional postpartum plan to help you quell your worry and look forward to your future with a new baby. The biggest downside of not overcoming your current anxiety is that you won’t have what you need in place for your postpartum period. Without preparation, you may find yourself overwhelmed with the multitude of decisions that new moms have to make every day. And it will be difficult for you to navigate through these choices under stress. Not only that, you may also feel unprepared for the intense emotional experiences that come after giving birth such as feeling isolated, resentful, or guilt. At the very least you will feel like you have to take everything on in the moment. You won’t be able to relax and enjoy your time with your newborn because you will be too consumed with trying to plan, organize, and orchestrate decisions on the fly. Although you are struggling with anxiety and feeling unprepared for this big change that is heading your way, try to remember that you are not the only woman to have navigated new motherhood. Everyone’s experience is different, but that does not mean you can’t find a sense of camaraderie with other new families and feel less worried about your upcoming experience. When you make a plan for your postpartum period and approach the transition with intention, there is a possibility for you to feel calmer and relaxed about your pregnancy and your upcoming birth. You won’t be evaluating choices as you go but following a clearly laid out plan ahead of time. That’s not to say you might not have to adjust the plan as you go, but you will have the education and awareness up front to do so easily. You have the ability to anticipate how you want your motherhood journey to go and to start putting that into place now before you give birth. This will help you feel more centered as you approach this lifestyle change. Yes, it’s true you may be feeling anxious about motherhood, but the key to achieving a sense of calm and connection is to create a plan of action for your family’s needs. Making these changes is not as difficult as you think because you want to ease your anxiety and feel more prepared. #10 Transition Back to Work. Every new mom who will be returning to work can ease the transition back by giving serious thought to what would help her and her family and what that might look like. Explore things such as: what will childcare look like, how will things get done when you or your partner goes back or if both of you decide to work full time? As a couple really create a plan for what this will look like and how it will best support the needs of your family. You can also consider what working from home or part-time might be like. #9 Account for Couple Time. A new baby is a shock to any marriage, no matter how connected the partners are before baby arrives. The entire system you and your partner have created will be upended in an instant. It’s important to nurture your partnership and prioritize your connection even though your new baby will feel like your utmost priority. In order to do this, think about: what family, friends, sitters, or nanny can babysit occasionally or regularly so that each partner can have time for themselves and also time as a couple. Consider what kinds of things you can do for yourself and your partner that nurture who you are outside of being parents. If there are brothers and sisters in the picture, be sure to devote some time to thinking about and caring for their needs when the new baby comes. Create a plan for labor which includes who will care for the older sibling while you are in the hospital. You can also think about: who is available to help with childcare, driving to school, and even planning special outings so the sibling does not get jealous or feel left out. Also, make sure this plan includes how to address what this will look like after the baby arrives and anticipate that you will need a couple months minimum of support for older siblings. If you have mom friends already, make sure they are nearby and available to meet up. If not, keep them as a source of support when you need advice or a good venting session. It’s important to have moms nearby to socialize with as they have been through what you are going through and can be beacons for what it can look like on the other side. What’s more, they will also be some of the first people to notice if something seems off with you or if you need more support. When clients schedule with PHH, we talk about meeting new friends through mom support groups or baby classes. This can be a valuable source of support once the baby arrives and you are hit with the intense emotions of postpartum life. One of the biggest things that goes by the wayside for new moms is eating healthy meals. However, your mood is often directly tied to nutrition, so eating balanced, healthy meals is essential to having a happier postpartum experience. When it comes to prioritizing meals for mom, take some time to freeze meals in advance. You can also take advantage of online grocery shopping and even grocery delivery. With that said, there is nothing wrong with ordering in once in a while. You can also ask that family or friends prepare meals for you instead of buying gifts for the baby. Sleep is hard to come by with a new baby but it’s also incredibly important. In fact, poor sleep is one of the leading indicators of postpartum depression and anxiety. Planning things such as: where baby will sleep so that you can get the most rest, how will deal with night wakings, and how will feeding be handled are important questions to address in your plan. Clients at PHH are encouraged to make a sleep plan with their partner where they discuss things like alternating each wake-up or alternating nights. When couples work together to address sleep concerns it goes a long way in fostering more connection and better postpartum health. #4 Build a Support Team. It’s important to build a support system as being a new mother is both emotionally and physically taxing. Your plan should address questions such as: who can help with household tasks, meals, night time wake ups, daytime caregiving, and evening support. If family is unavailable, you can also look into temporary move in professional support such as a baby nurse, lactation consultant or postpartum doula. Other sources of support include a therapist, moms group, or nanny/mothers helper. Being really clear on how you want to feed your baby is an essential step for easing perinatal mood struggles. Whether you choose breast, bottle, or a combination of the two, set a clear picture in your mind of what this looks like for you. Once you’ve made your decision, build a system around feeding so that the process is as smooth as possible. If bottle feeding, clean bottles and set up a drying rack for the night. With feedings use 2 oz pre-made bottles or have a pitcher of water ready. This will ease the stress of feeding time as all of the details will be taken care of beforehand. If breastfeeding, seek out a lactation consultant and have a support network in place before you begin nursing. This will ensure you have a place to ask questions and seek advice and may help you feel less anxious. One thing we do in session at PHH is discuss feeding choices and how to assess these choices if changes to methods or systems need to be made. #2 Determine How You Cope. Another thing to identify when you are dealing with the emotions of new motherhood is the best ways to help yourself feel better. Start with thinking about what usually helps you when you’re feeling sad or anxious. What did you do before baby to feel better? Can you do these things now that you’re a mom, or do you need some new coping strategies? Can you bring baby along or do you need time to yourself? Clients at PHH spend a lot of time in session learning new coping skills and choosing which ones are the best for themselves and their lifestyles. The number one thing you can do to bust through the emotional ups and downs of new motherhood is to reach out to others. Start to brainstorm who is available to reach out to by text, in person, or phone? What time of day are those people available? Who gives the best advice in general or who gives the best advice on a specific topic? When you schedule a session with Postpartum Health and Harmony, we will make an effort to build your network as well as increase your confidence in reaching out to others for support. Being a new mother is very exciting but also can produce a lot of anxiety, worry, and isolation. Yet when you integrate these 10 tips you can achieve a sense of calm about motherhood. 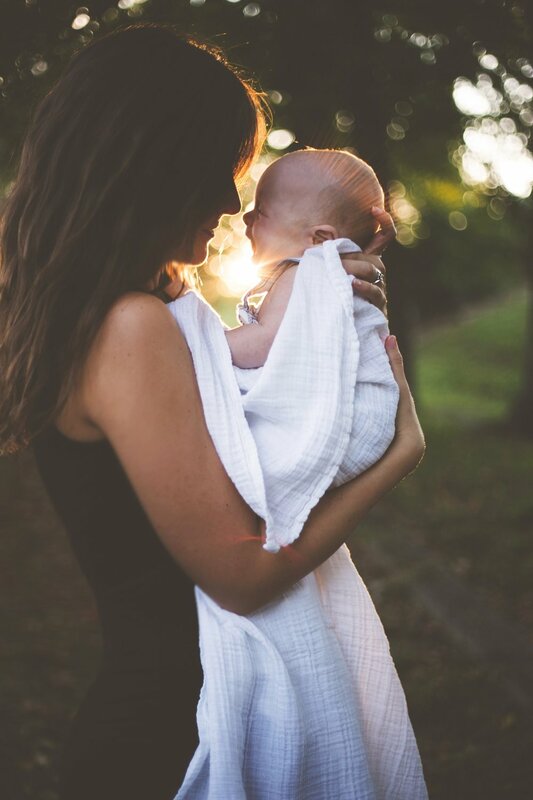 You absolutely can feel better and Postpartum Health & Harmony can help you learn to trust your gut, feel more connected, and confident in yourself as a new mom. If you are concerned that you may be experiencing postpartum depression/anxiety or you’re struggling to adjust as a new mother, please schedule your free initial phone consultation.